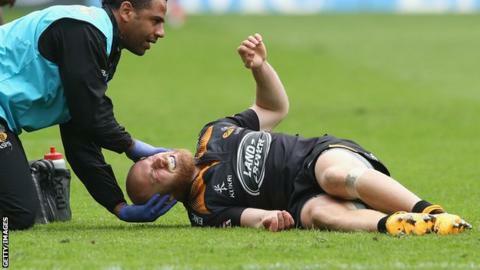 Wasps boss Dai Young is keeping fingers crossed that scrum-half Joe Simpson will be fit for next weekend's final round of Premiership fixtures. Simpson limped out of the final half hour of his side's 26-21 home defeat by Leicester with a knee injury following a heavy challenge. "Hopefully he'll be all right for next weekend. "Whether it was late or not, I don't know. But it wasn't given, so I guess not," said director of rugby Young. "Losing any of your quality players is always a bit of a blow. He brings a lot to us but Charlie Davies came on and certainly did not let us down. He's a different kind of scrum-half and got us moving quite well." Wasps travel to London Irish next weekend, still needing to win to be certain of a European spot. If they fail to pick up any points and Sale enjoy a bonus-point win at Exeter, they could still miss out. Leicester are at home to Northampton, who have already guaranteed top spot - and a home tie in the play-offs, possibly against the Tigers, who could finish fourth..
All next Saturday's six games have 15:30 BST kick-off times. Second-placed Bath host Gloucester, Sale go to Exeter, Saracens travel to relegated London Welsh and Newcastle entertain Harlequins. There were also encouraging noises about England players Joe Launchbury, Ed Slater and Geoff Parling. "It was great to have him back," he told BBC Sport. "We got 25 minutes out of him and I thought he added something. In the second half, we had a lot more ball and it was just good to see him out there." Meanwhile, Slater, who has missed the entire season with a knee injury, made his comeback for Leicester in the 60th minute. By contrast, Parling went off late in the first half after "popping" a rib cartilage, but Tigers director of rugby Richard Cockerill hopes he will be fit for next weekend's home game against Northampton..
"He'll be all right," said Cockerill, "if he can put up with a little discomfort. "I'm an ex-front rower. I've had a couple of them. If front rowers can play with them, I'm sure locks can." A crowd of 32,019 watched the game at the Ricoh Arena, breaking the attendance record for a Premiership ground outside Wembley or Twickenham.